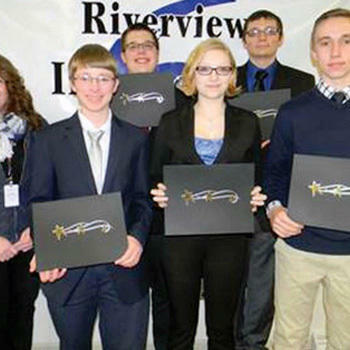 Earlier this year, a group of students from Cranberry Area School formed a STEM team to take part in the Governor’s Jobs 1st PA STEM Competition. To meet the goal of bettering the community, the team decided to create an app to encourage tourist in their local community. But first they needed to learn how to build an app, so they then turned to Treehouse to learn Swift. Treehouse provided the team with the skills they needed, and the Visit Venango travel app was brought to life. The Cranberry STEM team placed second in the competition, and the app is now under review in the App Store. When a small group of high school students decided to take on the Governor’s Jobs 1st PA STEM Competition, they had no idea what they would be in for. At least 250 hours were spent after school and on weekends developing a way to better their community, as per the goal of the competition. The team chose to create an app to encourage tourism in their small community, in an attempt to boost the economy, thus remedying the lack of industry and population. Research had revealed to the team a loss of over 10, 000 people, or nine percent of the total population. Along with those people, 5,000 manufacturing jobs lost in the last thirty years have never been reclaimed. Loving the problem-solving skills used in this competition, economic and technological, Jesse Osborne said, “Learning to fix them is fun.” This kind of character was found in each member, proved by their successes. But before starting to actually create the app, the team needed to learn code. They looked to Treehouse for the help they needed. The interactive lessons, motivational challenges, and engaging videos (especially the ones featuring Amit, whom several members named as a favorite instructor), helped the team develop the background they needed to succeed. The flexibility of the program to fit different learning styles impressed the entire team, but especially Tanner Fell, commenting, “the interactive game style learning and challenges let you know where your knowledge level truly was,” leaving the student with a program designed to further learning. The team chose to follow the Swift iOS Track because of its user-friendly nature for their original product, but they plan to use other tracks to continue developing their app. Treehouse may have given the team the skills they needed, but this team’s execution of those skills made the app possible. The design of the app is simple and straightforward, allowing for ease of use for all generations, residents, visitors, and trip planners. There are multiple categories including dining, shopping, and attractions. After clicking on an icon, you are connected to a chart with resources under that category, and contact information for each company and program. But before starting to actually create the app, the team needed to learn code. They looked to Treehouse for the help they needed. The interactive lessons, motivational challenges, and engaging videos helped the team develop the background they needed to succeed. The simplistic brilliance of the app shows that the strongest aspect of the team was their versatility. Each member was willing to try every part of the process, and they excelled. Every member participated in research, coding, debugging, and the presentation of the app to the judges at the competition. The hard work and dedication of team members Ian Hazlett, Jesse Osborne, Tanner Fell, Andrew Holden, and Andrew Gunn, earned them the second place medal at the competition. The team's advisor, Gayle Mitchell says, "Not often do you see this kind of motivation for a project. I am exceptionally proud of their efforts." Eventually, the team wants to code the device for Android devices as well, to reach an even broader audience. If they reach this goal, they hope to sell the app to a local tech business for maintenance. It is important to them that the community continues to benefit from the app, but they recognize that keeping the team together as they move on to college would be tough. This competition was an amazing experience for the entire team. Andrew Holden learned "to not get frustrated and give up when something doesn't work the first time, as there is always more than one way of accomplishing your goals." Those words of wisdom are just a small portion gained from this adventure. The community is rallying behind these students and their drive to create a better future for Venango County. For Andrew Gunn, this was his favorite part of the whole experience in creating the app, saying, “Every time we show it to someone, they are instantly thrilled, and that’s a very rewarding feeling.” This process of training has been the start of something great for these kids, and the completion of the app may catalyze even bigger things in their futures. Fixing the errors in their app taught them crucial skills needed to debug the mistakes, not only in the app’s code, but also in the coding of life, and accept challenges with a grace not taught from a textbook.